As a lifelong physical activity enthusiast, I love the “whole self” perspective of yoga. I have found great freedom in yoga. Freedom to look, feel, and see what is deep within me and learn what yoga is philosophically, emotionally, physically and spiritually to me. Freedom to explore my uniqueness and become aware of who I am. Freedom to live in the moment and just be. Freedom to “hang all the hats I wear” at the door and clear my mind of the things going on in my life. Freedom to experience stillness. Freedom to focus. Freedom to challenge myself in ways I never dreamed of, with no criticism, no judgment, and no expectations of the outcome. Freedom to experience all of this at my own pace, my own way. It is my goal, as a teacher of yoga, to convey this freedom to each and every one of my students. Yoga is a practice, for all of us. My hope is that with a consistent practice, each student will be pleasantly surprised by the positive changes that occur in all areas of their life (mental, emotional, physical, and spiritual)….both on and off the mat. 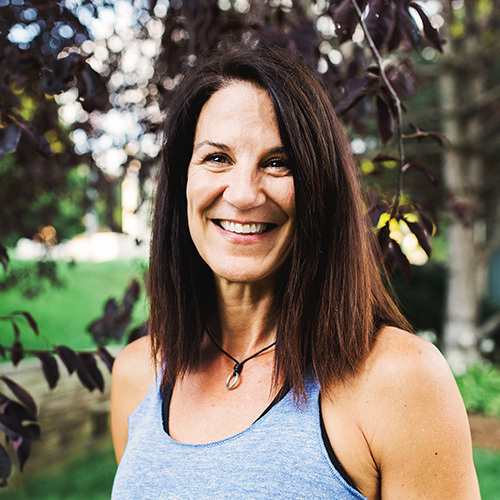 I have a Bachelor of Fine Arts degree in Dance from the University of Nebraska in Lincoln and completed Power Yoga Teacher’s Training at Omaha Power Yoga with Jeff Beaudoin, Ph.D.. I have lived in Omaha since 1983 and am a married mother of 4 children. NEW STUDENTS: Try 30 days of unlimited classes for $45!